The recipe for this yummy treat makes one large strawberry charlotte. Double/triple etc. for however many you want to make. Grease and line a ramekin. Cut the cake into small (1/4") slices and line the ramekin with the cake, pushing firmly into the shape of the ramekin. To do this, cut 2 circles, for the top and bottom, and use the remaining pieces for the sides. Remove crusts from the cake before shaping. Combine the preserves and water in a saucepan, mix and heat until bubbling. Add chopped strawberries and stir for 2 minutes until they are slightly softer and covered in the syrup. Allow strawberry mixture to cool. 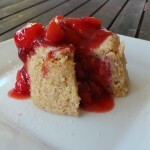 Pour ¾ of the strawberry mixture into the cake lined ramekin and then place the top cake circle on top and press down. Refrigerate until needed and pour the remaining strawberry mixture over the top.